Almost no garden subject has been written about at greater length, or with more enthusiasm, than roses and their cultivation. Nevertheless, there is plenty that can be said on the matter, and the fact that roses grow easily in most parts of Britain only makes the keen gardener more than ever determined to think of everything in order to cultivate the flower to its greatest perfection. Certainly roses will repay your attention. Whether they are grown on a fairly large scale, as, for example in the Italian rose garden at Trentham. Staffordshire, or in smaller groups in the home garden, roses provide tremendous pleasure at a reasonably small cost and minimal effort. In an article which concentrates on the technical side of the subject it would be wrong to forget entirely the historical and romantic associations of the flower. Chaucer’s Romaunt of the Rose, with its associations of courtly love, and the Scene in the Temple Garden, London, in Act II of Shakespeare’s King Henry VI, Part 1, when the rival factions in the ‘Wars of the Roses’ plucked the red or the white rose, are just two examples of how the rose from the earliest times thas come to symbolize the deepest feelings of countless men and women. Modern roses fall mainly into the following groups : hybrid tea, floribunda, shrub, climbing and rambling, polyantha pompon and miniature. Hybrid tea These include the large flowered, shapely bedding and exhibition roses, many with a strong fragrance. The group merges the few remaining hybrid perpetuals in general cultivation and what used to be known as ‘Pernetianas’ , representing all the original pure yellow, orange, flame and bicolor varieties. The first hybrid tea varieties were obtained crossing the hybrid perpetuals with the tea-scented roses. Floribunda These include all the original hybrid polyanthas evolved by the rose breeder Svend Poulson of Denmark. He crossed poly-pompons with hybrid teas, and all the many-flowered roses (other than the poly-pompons), the climbing and rambling groups and the Pemberton, socalled ‘hybrid musks’. The term ‘hybrid polyantha’ was discontinued soon after World War II, because varieties were being added to the group each year with little or no true polyantha ‘blood’, resulting from crossing hybrid teas with various groups of shrub roses. Shrub This group covers a very wide range of modern hybrids of species and also includes all the old types of garden roses, often referred to as ‘old-fashioned’ roses. Climbing and rambling Practically all rambling and climbing roses derive from the Synstylae section of the genus. They include hybrid tea climbing sports. Polyantha pompon These have largely been superseded by modern floribundas and the miniatures. They are compact-growing, cluster-flowered bedding roses, with small rosette type flowers similar in appearance to those of the old wichuraiana ramblers. Miniature These are tiny replicas of the hybrid teas and floribundas, with flowers, foliage and growth scaled down in proportion. They are mainly hybrids from R. chinensis minima and may never exceed 15-30cm (6-12in) in height. Selecting and ordering It is important to order your roses early in the season, that is between June and August, when most of the rose shows are held. During this period the roses may be seen in flower at the nurseries and by ordering promptly you can be sure of the most popular varieties being available. It is advisable to order from a rose specialist, and from one who buds his own plants, rather than from a man who is not a producer. This is because the grower selling under his own name has a reputation to maintain, and no well-known rose specialist can afford to sell plants which do not give satisfaction. When you visit the nursery, or display garden adjoining it, watch for the habit of growth, disease and weather resistance and freedom of flowering of any of the species provisionally selected. There is a great deal of variation in the quality of maiden rose plants supplied from various sources, and cheap offers are often the dearest in the long run, as the quality is normally very inferior. Bearing in mind that a healthy rose, when once properly planted, may last from 12 to 20 years or more, with reasonable treatment, it is false economy to attempt to save on the initial cost when this may mean the difference between success and failure. It is essential to obtain plants from a reliable source. This is because of the need for them to be hardy and well-ripened, true to name, budded on a suitable rootstock which will transplant readily and not sucker freely and free from disease spores. Bare root roses are sometimes stillon offer in overheated departmental stores, but nowadays these are normally offered packed in individual polythene bags. The trouble with these roses is that they are frequently subjected to this overheated atmosphere for considerable periods, with consequent dehydration showing in bone-dry roots and shrivelled stems. A rose purchased in this condition is unlikely to flourish unless measures are taken to plump up the wood again by burying the entire plant for about ten days in moist soil, before planting it in its permanent quarters. Another disadvantage of these pre-packaged roses is that each package acts as a miniature greenhouse, and the stems are forced into tender premature growth while they are awaiting sale. This tender growth receives a severe check when the plants are taken out of their packages and exposed to the hazards of the open garden. Container-grown roses are offered at many nurseries and garden centers. 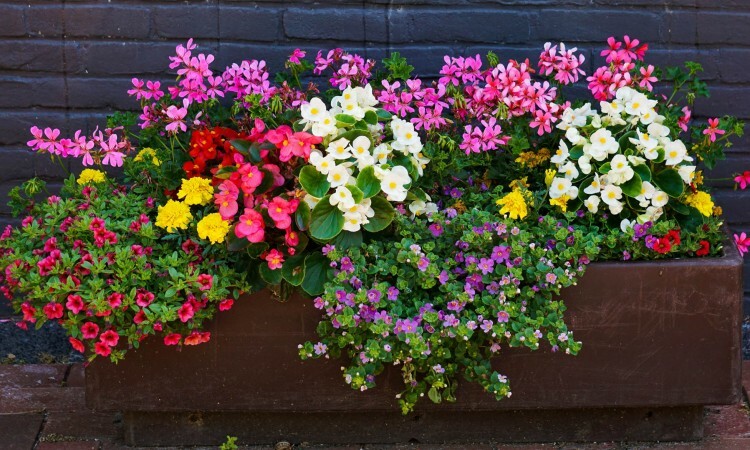 These enable the planting season to be extended throughout the year, as no root disturbance should occur in planting from containers into the permanent beds. They may even be planted when in full bloom. Although it is unwise to succumb to cheap offers in end-of-season sales, nearly all rose specialist firms offer collections, their selection of varieties, at an all-in price lower than the aggregate cost of ordering the same varieties individually. For the beginner who is not fussy about varieties he starts with, provided that they are popular, this is as good a way as any of placing a first order, as the quality of the plants should be equal to the nurseryman’s normal standard. Soil Ordinary well-drained soil which has grown good crops of vegetables will suit most roses. Ideally a medium heavy loam, slightly acid (pH 5.5 to 6.5) is best. The site should be open and away from large trees and buildings, but not in a draughty position between two houses. On poor soils plenty of old chopped turf, compost, hay and straw and vegetable waste should be added to the subsoil when preparing the beds by double digging, together with any animal manure available. The top spit will be improved by adding granulated peat, compost and bonemeal (at the rate of 120g [4oz] per sq m [sq yd] and hoof and horn meal (at 60g [2oz] per sq m [sq yd]). These should be thoroughly mixed with the soil and not left on the surface or in layers. On heavy land the beds should be raised a little above the general level, but sunk slightly on sandy soil. Perfect drainage is vitally important. roses must fit in with other plants in mixed borders. In a formal rose garden there are separate beds for individual varieties, whether of hybrid tea or floribunda type. These beds are cut in lawns with the possible inclusion of several standard or half standard roses of the same variety to give added height. and to reduce the labour of weeding. outside rows and the edge. This will be sufficient to avoid an overhang with nearly all varieties, which would otherwise interfere with mowing and trimming the edges, if the setting is grass. cut in a lawn, apart from looking fussy, require the edges trimming regularly and also slow down the operation of mowing the lawn. than to dot them about in ones and twos, and this holds good whether beds or borders are being planted. gradings with an occasional group of taller varieties running towards the front, or a single pillar or tripod with recurrent-flowering climbing roses about the middle. and prefer color harmonies in blends of soft pink, apricot and orange shades. Some may prefer to group the same, or similar, colors together. The object of color blending, of course, is to bring out the best in each color by careful association of adjacent colors. Thus, white and orange-scarlet next to each other will emphasize, by contrast, the purity of the white and the brilliance of the orange-scarlet. On the other hand, orange-scarlet next to deep carmine pink would be an unhappy combination, as the blue in the carmine pink would look crude and harsh by contrast with the orange-scarlet. As a general guide shades of yellow will associate well with shades of red. Orange, flame and apricot contrast well with dark crimson. Deep pink, especially carmine pink and cerise, is safest with cream, primrose yellow or white, and the same is true of lilac, lavender and mauve. These shades in roses are often dull in the garden and may need enlivening with bright yellow close by. Scarlet, orange-scarlet, crimson, deep pink and cerise are better separated from each other by using buffer groups of the soft pastel shades of cream, flesh, amber and off-white. The question of whether to use other plants for carpeting rose beds often arises, bearing in mind that the roses do not normally provide much color until June. Violas as ground cover or border plants add color in the spring. Low-growing plants, such as aubrieta, arabis and the ‘mossy’ saxifrages may also be used for edgings, but they will need shearing back after flowering. There is no reason either why shallow-rooted annuals should not be used, such as eschscholtzias, love-in-a-mist and night-scented stocks. Slow-growing conifers may also be used for effect. These have the advantage of being evergreens, and will improve the appearance of the rose garden, although the rank growers should be avoided. The Irish juniper, Juniperus tommunis hibernica, is excellent and cakes up little space with its narrow, erect growth. The same is true of Chamaecyparis lawsoniana columnaris glauca in blue-grey, and the Irish yews, Taxus baccata fastigiata, and the golden aurea. Two very splendid slow-growing forms are Chamaecyparis lawsoniana ellwoodii and fletcherii. Both of these will remain below or about 1.6m (5ft) in height for many years. Clematis may also be planted either by themselves or with recurrent flowering pillar roses, and will often be outstanding, introducing colors not found among roses. Clematis jackmanii in rich violet-purple will make a splendid pillar when planted with roses ‘New Dawn’ or ‘Aloha’. Planting This may be done safely from late October to the end of March whenever the soil is friable and free from frost. Autumn planting usually gives the best results, provided the soil is not too wet for planting firmly; otherwise it will be better to wait for suitable conditions. On receipt of the bushes they should be heeled in temporarily in a trench, throwing plenty of soil over the roots and treading firmly. When the soil in the bed is friable, a large bucket of moist granulated peat, into which a couple of handfuls of meat and bonemeal have been mixed, should be prepared. The position of each bush in the bed is marked with a stick. Distance apart will depend on the vigor and habit of the variety, but on an average soil about 45cm (18in) each way will be about right for most. Exceptionally vigorous kinds, such as ‘Peace’, which need light pruning, may be better at least 60cm (2ft) apart. The roots should be.soaked for a couple of hours before planting. A shallow hole is taken out wide enough to take roots when fully spread. The plant should be inspected carefully for suckers emerging from the root system, and any found should be pulled off. Damaged and broken roots must be trimmed and unripe or damaged shoots removed, also all leaves and flower buds. The prepared plant is then tested in the hole for correct depth; the union of the stock and scion should be just covered with soil. A few handfuls of the peat mixture are thrown over and between the roots and the hole half filled with fine soil and trodden firmly before filling up to the correct level. Standard roses are staked before covering the roots to avoid possible injury. It is beneficial to mulch new beds with 5cm (2in) of granulated peat, to conserve moisture. Pruning All dead or decadent wood should be cut out as soon as it is noticed at any time. Full-scale pruning should be done when the bushes are dormant, or nearly so. This may be done at any time from January to mid-March, depending on the weather and the area. In the first spring after planting all groups, except climbing sports of hybrid tea roses, should have weak or twiggy shoots removed entirely, together with any sappy growth. The remainder should be cut back just above a dormant shoot bud pointing away from the center of the plant and not more than 16cm (6in) from the base. Spring planted roses may be pruned in the hand just before planting. Climbing sports of hybrid teas should just be tipped and the main shoots bent over by securing the ends to canes or wires, to force the lower buds into growth. On light hungry soils it may be advisable not to prune any groups the first year, but to encourage as much new growth as possible by mulching and watering. Subsequent years Pruning of hybrid teas may be hard, moderate or light, according to circumstances. Light pruning is generally preferable on poor sandy soils which do not encourage a lot of new wood. This means cutting back new shoots formed in the previous season to about two-thirds of their length and removing all weak or twiggy growth. On average soils moderate pruning may be done, involving cutting back all new wood about half way and removing entirely the weak and twiggy shoots. Hard pruning is seldom necessary for modern varieties, but some will respond to it on a good soil with ample feeding. It requires the cutting out of all but two or three of the main growths and reducing these to just above a dormant budabout 16cm (6in) from the base. Floribundas require different treatment. The object is to ensure as continuous a display of color during the season as possible. This requires the application of a differential pruning system, based on the age of the wood. Growth produced from the base in the previous season should merely be shortened to the first convenient bud below the old flower truss. The laterals on two-year-old wood should be cut back half way and any three-year-old wood cut hard back to about three eyes from the base. As with all groups, all dead, decadent, unripe and twiggy wood should be removed entirely. Shrub roses and the old garden roses in general do not require much pruning. Apart from the cutting out of dead and exhausted wood and cutting back a main growth near the base occasionally to encourage new basal growth, pruning is mainly confined to remedying overcrowding and ensuring a shapely outline. The treatment of climbers varies with the group to which they belong. Generally, the more recurrent flowering the variety, the less rampant is its growth and the less the pruning required. The once-flowering wichuraiana ramblers, which renew themselves with new canes from the base each season after flowering, should have all old flowering wood cut out and the new canes tied in to take its place. Climbing sports of hybrid teas and other climbing hybrid teas require little pruning, but should be trained fanwise or horizontally to force as many dormant eyes into growth as possible. Flowers are borne either on laterals or sub-laterals. Recurrent flowering pillar roses, such as `Aloha’, ‘Coral Dawn’ and ‘Parade’, require only the removal of dead or exhausted wood and any which is weak or twiggy, plus sufficient thinning out of the remaining wood to avoid overcrowding. General cultivation Suckers must be removed before they grow large. They may come from any point below the inserted bud and with standards they may appear either on the standard stem below the head or anywhere on the root system. The roots of roses should not be disturbed any more than is essential to the removal of weeds and suckers. Where light or moderate pruning is practised, summer thinning or de-shooting may be necessary, and this will be routine procedure for the keen exhibitor. All side shoots appearing before the terminal buds have opened should be pinched out as soon as they are large enough to handle. While watering is not a practical proposition on a large scale, newly planted roses may need the roots soaking thoroughly at weekly intervals during hot weather. Roses planted in dry positions, against walls or close-boarded fences, will also require regular watering in the summer. Removal of spent flowers is essential if a later crop is to be produced and seed pods should never be allowed to develop. Dead-heading should be a routine operation throughout the season. In the first summer after planting merely the flower and foot of the stalk, without any leaves, should be removed, but in subsequent years the growth from the pruning point may be reduced to half way, to ensure a fine second display. Disbudding will also be necessary for the keen exhibitor and those who insist on high quality blooms. Not more than three buds are left on hybrid tea stems for garden display or a single bud for exhibition. In the autumn any long growths should be shortened to minimize possible gale damage. Feeding Before embarking on a feeding program you should find out whether your soil is naturally acid or alkaline. There are a number of soil-testing kits available. Lime, if required, is best applied in the form of ground chalk (calcium carbonate) during the early winter months, at 85-110g (3-4oz) per sq m (sq yd), sprinkled evenly over the surface of the beds and left for the winter rains to wash it down. By the time the spring mulch is due, the lime should have done its work. As roses prefer a slightly acid soil, it may be necessary to apply lime every year, though never on chalky soil. During February and March it is beneficial to apply a dressing of meat and bonemeal at 110g (4oz) per sq m (sq yd), pricking it just below the surface. If this proves difficult to obtain in small quantities sterilized bonemeal may be used instead. About the middle of April a complete rose fertilizer can be applied to established beds, according to the makers’ instructions. There are many of these available, or a useful compound fertilizer may be made up quite cheaply from 16 parts of superphosphate of lime, 10 parts of sulphate of potash, 5 parts of sulphate of ammonia, 2 parts of sulphate of magnesia (commercial Epsom Salts) and 2 parts of sulphate of iron. These parts are in terms of weight, and the ingredients must be mixed thoroughly, any lumps being crushed. The fertilizer should be sprinkled evenly at about a level tablespoonful per plant, afterwards hoeing and watering in if necessary. The temptation to use a double dose in the hope of obtaining spectacular results should be resisted. Alternatively, for those who do not wish to go to much trouble, many firms market a rose fertilizer to the well-known `Tonks’ formula, which was based originally on the chemical analysis of the ashes of a complete rose tree after burning it in a crucible. The formula comprises 12 parts of superphosphate of lime, 10 parts of nitrate of potash, 8 parts of sulphate of lime, 2 parts of sulphate of magnesia and 1 part of sulphate of iron. It should be applied at the rate of 85-110g (3-4oz) per sq m (sq yd) and pricked in with a border fork. [1oz] per 4.51 [gallon] and superphosphate of lime (at 28g [loz] per 4.51 [gallon]) may also be used safely at these strengths. The important points to watch in liquid feeding are: to use the feed in very dilute form only; to ensure that there is already plenty of moisture in the soil before applying and to stop application at the end of July.